MANILA, Philippines — China continued on Wednesday its test flights over the South China Sea, landing two civilian planes on one of its man-made islands built atop of Philippine-claimed maritime feature Kagitingan (Fiery Cross) Reef. 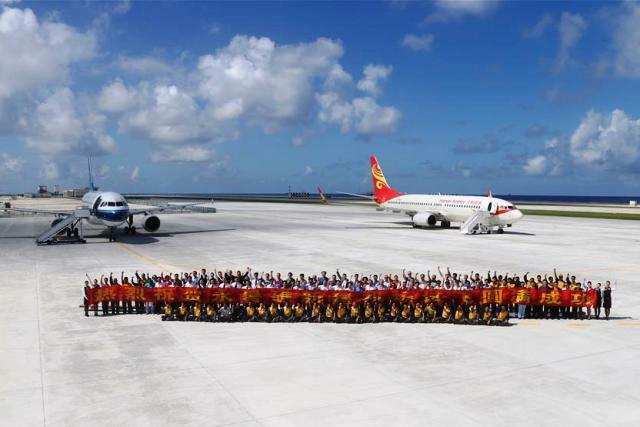 The Chinese Ministry of National Defense reported Thursday that Beijing conducted two more "successful" flights—of a China Southern Airlines aircraft and a Hainan Airlines plane—on a newly-built airfield on the reef. Chinese personnel aboard the planes are seen in a group photo taken after the landing of the two planes. The planes flew back to Haikou that afternoon, the ministry noted. China insisted that despite international criticism, the airfield does not undermine regional peace and stability. State news outfit Xinhua said the new gateway "will greatly enhance the safety of the vessels" in the South China Sea by facilitating search and rescue, disaster prevention and reduction, and research and conservation. The first test flight over the weekend drew a protest from Vietnam and opposition from the United States for raising the longstanding tension with rival claimants. State Department spokesman John Kirby reiterated a US call for a halt to land reclamation and militarization of outposts in those waters, where China and five other Asian governments have competing territorial claims. "To begin flight operations at this new airfield in a disputed area raises tensions and threatens regional stability," Kirby told reporters in Washington. He said claimants should instead focus on reaching agreement on acceptable behavior in disputed areas. "We have made this case clear repeatedly, and we will continue to make it," he said.